smoking | six words to change the world. another great overheard in new york. Ten-year-old tourist girl wearing pink Crocs: Smoking is bad for you! Smoking queer: Crocs are for retarded kids who can’t tie their own shoes. 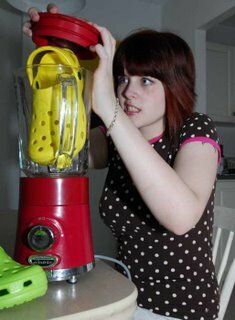 Perhaps a little harsh, but remember people: CROCS NOT OKAY UNLESS YOU ARE DOING YARD WORK OR ARE UNDER THE AGE OF FOUR.